Human Nature - Kris Worsley Wildlife Photography: Grey Squirrels: in the bad books! Grey Squirrels: in the bad books! Grays, a nut and me. It’s another quiet, calm, weekday morning and I’m breathing in lungfuls of fresh breeze as I lie on my belly with my camera. 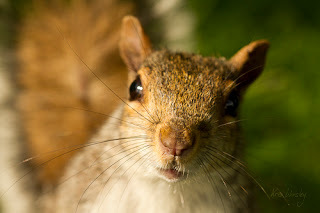 About ten inches, no more, in front of my lens, is a grey squirrel feeding happily on a nut that I’ve just handed him. A mallard is padding round in the background after seeing a mass of squirrels converging for food all around me, and wondering what all the fuss is about. 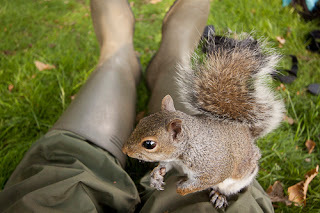 Moments later I feel a ticklish sensation as another squirrel climbs up onto the back of my legs, walking slowly up my body, up to my shoulders before resting on my head (these guys certainly know how to get your attention when they want food). When I shake my head, he jumps off, and it doesn’t surprise me to find that this is the dominant squirrel of this group, bolder, cheekier, more confident than the others. He is possibly more endearing to me in making that close connection with me that makes days like this so much fun. Ethically, it’s right and proper to keep a proper distance from natural creatures, but sometimes I can’t help but take the opportunity to stroke the fur down his back as he eats; he is completely unmoved by it. He’s not scared, though he doesn’t appear to gain any pleasure from the contact either. Our contract of contact sits entirely on their love of food. Nothing else. The hunt for red’s not over. This is how I’ve spent a great many days this year. 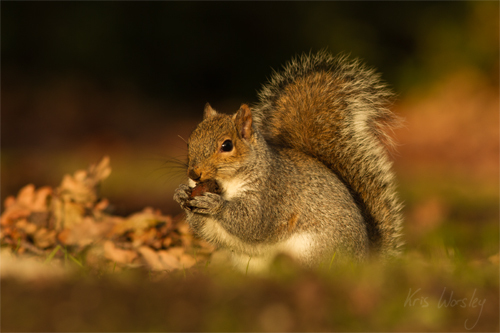 I had set out at the start of the year to make a project of photographing squirrels of both red and grey varieties in England. Nevertheless, the greys here are ubiquitous, while the reds are consigned (by the greys) to small pockets of the country and photographing them requires more planning. 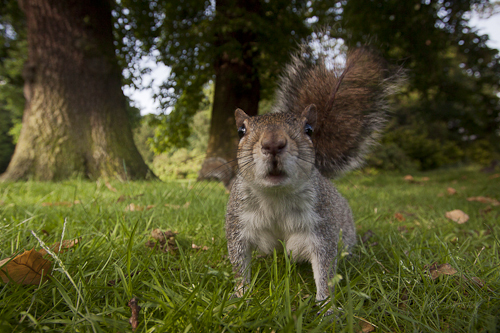 And there’s the problem with grey squirrels. Much as I’m enjoying my time in the company of these little grey mammals, I have mixed emotions about celebrating, photographing and feeding (in abundance) a species which has done so much harm to our country, driving down the number of native reds all but to the point of extinction, and causing untold damage to many natural places ever since they were introduced just over a century ago. I’ve been thinking about this over the last couple of weeks in particular, with the passing of the 4th July celebration for American Independence. A century after the declaration of Independence was signed that the first grey squirrels were released into the England to make their own bid for freedom and independence. For many residents in modern Britian, grey squirrels are generally thought to be as British as afternoon tea; they are a common feature in our landscapes whose presence here is unquestioned by many. ‘Oh, I think they’re rather sweet,’ said Joan, unthinkingly. ‘It’s the songbirds,’ explained Polly. ‘You can have squirrels or songbirds, but not both. 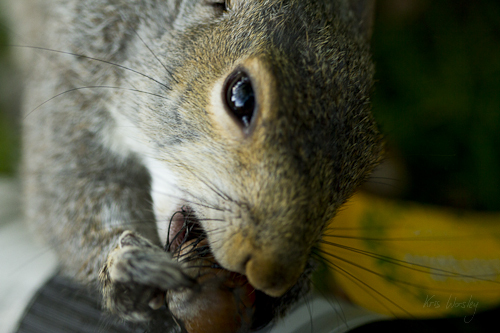 These grey squirrels eat the eggs, and they eat the heads off the chicks. Nice and crunchy, you see. I’m voting for songbirds. Bugger the squirrels. Got to get rid of them. Polly’s prejudices are played out more aggressively in the story: this passage comes just after she recounts recently shooting a grey squirrel in the garden (I’ve spoken to several nature lovers who are happy to do this, although much of this results in inhumane killing that most conservationists agree this will have no significant effect on the dominance of grey squirrels). Her prejudices may have been a little too severe however (there’s also a darling cat in the house, which is more likely to be the perpetrator, but don’t tell Polly!). The first pair of greys in Britain were released in 1876 is Henbury Park, Cheshire, followed by five more pairs in Bushy Park, London in 1889. However, none of these pairs lived up to their associations with fertility (according to Japanese mythology) and they soon disappeared without trace. As far as we know, they died spinsters. So the first successful introduction was in 1890, where 10 more animals were introduced to Woburn Abbey, which quickly spread out (and, yes, Woburn Abbey is also the birthplace of afternoon tea, so it’s not difficult to see how the little critters could have become Briticised as they bred and spread…I’ve been staring into space for the last five minutes wondering if I can get ‘jam’ into that sentence too, but I should probably conserve my original topic so as not to jar the writing). The site at Woburn has in fact played host to many a foreign creature, since (in a strange twist of irony) it now boasts a safari park within its grounds. The squirrels were not fenced in however (and as far as I know, they won’t make a habit of pulling the windscreen wipers of your car) and Victorians wrongly thought they would be a great addition to the country. It was after 30 more releases across England, Scotland and Wales between 1902 and 1929 that their unpopularity really set in. In 1929, Eric Parker, who also gets a mention in de Bernières’ story as the last man to see a red squirrel in the local village, called for county councils to launch an extermination of greys. This was followed in 1931 by the launch of the Anti-Grey Squirrel Campaign, and since 1938 it has been illegal either to import a grey squirrel into Britain or to keep one in captivity. Polly’s prejudices in the de Bernières story might be a little exaggerated, although the destructive tendencies of these creatures are well documented. In addition to their role in eradicating the population of red squirrels in many parts of Britain, they’re often seen stripping bark from trees which can result in the tree being maimed for life. Nevertheless, it might also be added the deer are responsible for this same behaviour and are by no means demonised for it with the same degree of prejudice. The strange conundrum, however, is that this is behaviour unique to the British greys; those greys (or grays) in America leave the trees nicely in tact so why they destroy our trees is something of a mystery. They don’t seem to be doing favours, although many current approaches keeping back their numbers are aimed not just to create spaces for our native reds to continue thriving (particularly in ‘island communities’ such as Anglesey and the Isle of Wight where numbers are easier to control), but for gamekeepers to ensure that the food left out for pheasants is not hoovered up by the shady-tails before the pheasants get close. Nevertheless, it does give the grey squirrel some hope. We might find ourselves taking a dislike to the behaviour of these squirrels as misfits in our British ecosystem, but that clearly doesn’t give us sufficient reason to dislike them as an entire species. 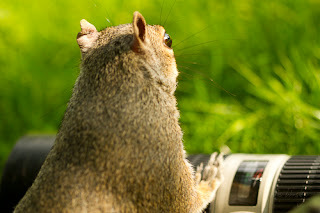 Our delight of watching squirrels eating at close quarters is something we share with our ancient ancestors who named the creature after its tendency to sit in the shadow of its big, bushy tail (the Ancient Greek word skiouros [σκίουρος] literally means ‘shadow-tailed’). 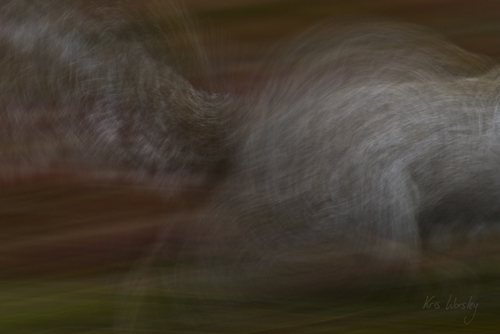 This is an idea which has influenced a great number of my pictures over the course of the year, as I’ve tried to find new ways to capture the shape of the squirrel and its tail. Spending so much time in their company has been a real eye-opener, however. They’ve become so accustomed to me and my carrier bags full of food that they don’t think twice about climbing onto my head, sitting on the open palm of my hand (they’ve realised now that that’s a good way of hogging all the nuts) and crawling over my back whilst I’m lying on the floor trying to photograph them. They have long established themselves as cheeky blighters. 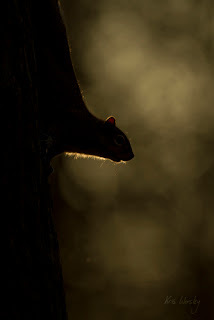 There’s an old Norse story of the squirrel as a mischief maker, creating strife between the serpent on the ground and the eagle at the top of the tree, specifically the Yggrrasill (the tree that holds the nine worlds). This vision of their silhouettes shooting up and down trees are break-neck speed has been a common sight for me watching them. So like so many of my ancestors going back over millennia, watching these squirrels in such detail has been a source of great fascination. Being in the company of any animal that accepts you totally, provides you with a privileged view of their extraordinary behaviour, behaviour you will never witness simply by watching them on the bird table. Within each colony of squirrels is a very carefully organised hierarchy, both within the colony as a whole and within gender groups. 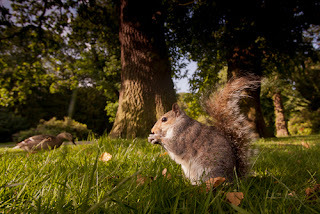 It isn’t simply about one squirrel being more dominant and bolshie than others – there isn’t a distinct pecking order, it’s much more subtle than that - but it’s possible to witness the way in which certain squirrels make room or simply give way to other individuals as they feed in a group, and as I get to know the individuals in a group of 10 or 12 squirrels, the relative roles and positions of each within the groups becomes clear through the consistency of their behaviour. They threaten each other regularly with little noises and squeaks, most often by chattering their teeth with great dexterity (one sound in their vocabulary of 11 distinct noises which you will only hear by being within about a metre of them) and occasionally, if one oversteps the mark, they will fight each other (I’ve even had two fight me on my chest whilst I was lying back on the floor). Our greys are certainly here to stay, and it seems that they have now become ‘our’ greys, though some are still not convinced. (As an English person, it would be hypocritical to dislike the greys for pushing reds into the far corners of our country since it’s what we did to the Celts years ago!). For me, working with individual animals as closely as I have with these, it’s impossible not to have some level of admiration for them – I’m not talking about the ‘cute’ factor, either. I’m talking about building up an intuitive understanding of their behaviour within the world as they see it within the makeup of their societies. Perhaps I’m reaching the territory now of superficial blah blah blah, but I’m writing this because something deep inside me cries out that I need to justify myself for having developed such an interest in the greys. Do I need to justify myself? I’ve still not decided. This was an interesting article, and I love your photographs! 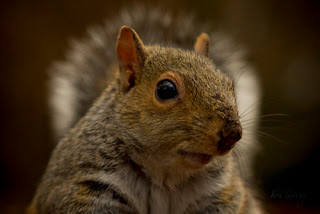 While I support controlling their numbers in areas where red squirrels are present, or when necessary to protect other wildlife, it is clear now that grey squirrels are hear to stay and as such we should make the most of them. I for one enjoy seeing them and photographing them too!